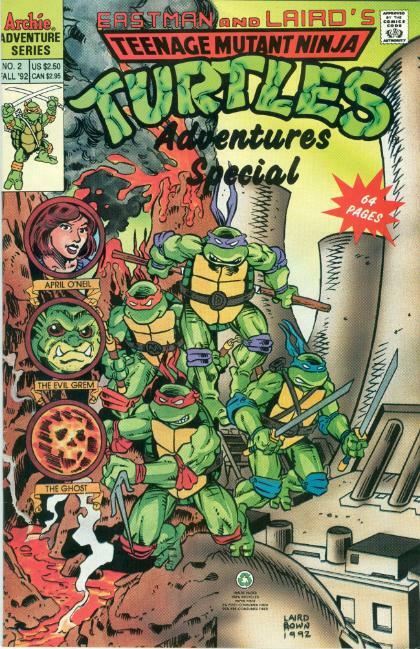 *These stories continue directly from those published in TMNT Adventures Special #1. *Chronologically, I would place these stories in-between TMNT Adventures #26 and TMNT Adventures #27. *The letters page in TMNT Adventures Special #4 claimed that all stories in TMNT Adventures Special #1 and TMNT Adventures Special #2 take place between TMNT Adventures #4 and TMNT Advetures #5. However, references to issues taking place afterward as well as April working for WRTL instead of Channel 6 forces these stories to take place much later in the timeline. *This issue also contained two bonus pin-ups by Brian Thomas. 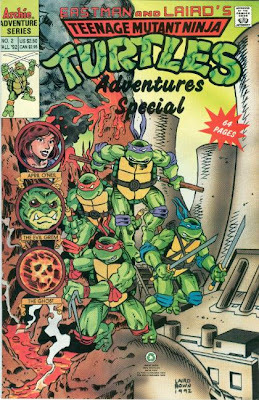 These early TMNTA Special covers were kinda creepy. Just look at that Nuclear Reactor melting down! "All ye who have ears to hear, heed this warning! Abandon all modern energy sources! If wind power or hydro-electricity won't be financially feasible, just use candles and be happy!"